I have mentioned a few times that my husband is from Finland. 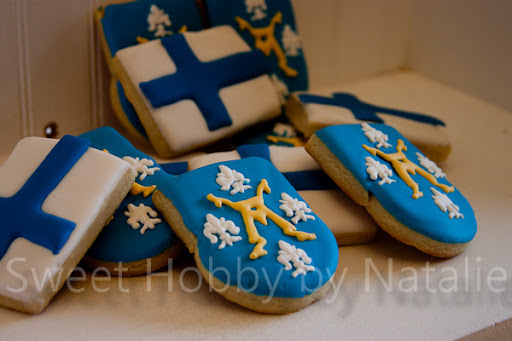 So it is no surprise to see Finnish themed sweets on this blog. These cookies were made for a special couple who mean a lot to my husband. When my husband was 16 years old he spent a year in America as a foreign exchange student. He lived with the Mortensens for a year, and he loved every minute of it. They had kids his age, they went on fun trips and he got to experience high school in America. Glenn, the Dad, served an LDS mission in Finland for 2 years when he was 19 years old. While there, he met my husbands father and uncle, and they became fast friends. Glenn suggested to my husbands parents that they send Mikko here for an exchange program and my husband was more than eager to do so. Glenn and Martha have always been so loving to my husband and his family, and when we go to visit my in-laws we also almost always try and visit Glenn and Martha because they now live in the same town. So Glenn and Martha have raised six children and have many grandkids and decided to serve another mission as a couple, and of course were called back to Finland. They are serving in Turku, Finland and will be working with the young adults there. They will do an amazing job no doubt. 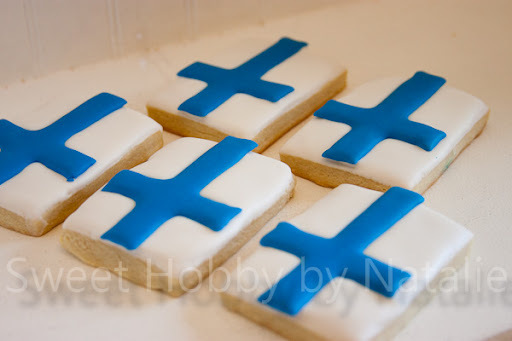 They had their farewell a couple of weeks ago, and I wanted to make some cookies for them so here we have the Finnish flag. 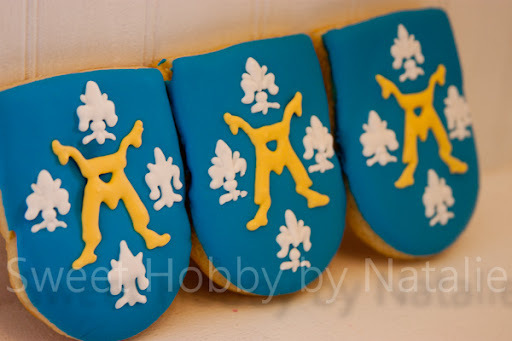 And this is the crest of the city, Turku. They will be missed by their family and friends, but we all will be blessed by their example and missionary service!